It will improve the look and slightly increase the clearance but I don't think it will improve the others. It might get a little better economy on the highway but it will reduce your towing power. It will also effect your speedometer. You'll be reading a bit lower than your actual speed. bms1939 - 4/14/2008 4:41 PMIt will improve the look and slightly increase the clearance but I don't think it will improve the others. It might get a little better economy on the highway but it will reduce your towing power. Will be slower off the line too. If you load it down, make sure you use tires that have similar ratings. If they are LTs, dont get Ps. What's the rear end ratio? With the only variable being the sectionwidth the diameter isn't going to change dramatically. One thing to check is the existing clearances in the wheel wells, fender clearance in the rear and turning clearance in front with the steering &quot;hard-over&quot; in both directions. It's not a big jump, but there may be issues. I've got a Grand Cherokee that's due and 17&quot; rims really affect the possibilities of tires available. This is my 2500 with 285-75-16s. It has a 410 rear, and with the tires it brought the rpm's at highway speeds just right and still would tow my 31 Island Runner pretty easy with no up shift/down shift issues unless you got above 75. I did the very same on a 1999 C2500. Speedo is dead nuts now with bigger tires. Sharp turns inside tires rub the sway bar..no big deal. Speedo is easy to check. On the highway 60 mph should take exactly 60 seconds..72 mph should take 50 seconds. Thanks for the replies. FYI ratio is 3.73 engine is vortec 8100. Truck has tow pkg., including "tow" feature on trans. (changes the shift points in towing mode) Boat/trailer (Glacier Bay 2670) max loaded weight approx. 9000 lbs. Thanks Bugbuster and others for your input. Just some info here...I have an '02 F-250 4x4 Powerstroke. It came with E rated 265/75/16's, when they wore out I went to D rated 285/75/16's, wanted the E rating but no one made them at that time in the 285's. Where I live I have a slight 1/2 mile downgrade to the hwy, did a test because my fuel mileage took a hit. With the E rated 80 psi tires I can roll from a dead stop to about 40 mph to where I have to get on the brakes, with the D rated 65 psi tires I can get up to 31 mph. BIG diff. in rolling resistance between the two. Now I see that BFG makes a 285/75/16 TKO in an 80 psi E rating, go to Tirerack.com to see the info and reviews ..........but they do cost about $195 ea. An alternative in an E rated 80 psi 265/75/16 is the Firestone Transforce about $135....also on Tirerack. Which ever tire you buy make sure its an E rated tire, these big vehs need the extra load carrying capacity. 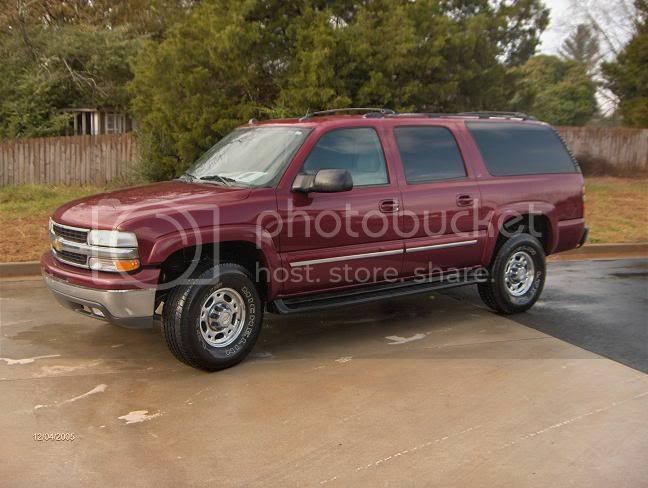 A 2500 Suburban should run 265s with no adjustment needed. I run 285 BFG TKO that are E rated on my 2500 HD Silverado. I also run 285s on my Tahoe. It is just a matter of cranking your torsion bars up about 2 or 3 turns. All chevys come out of the factory riding nose low anyway. The tire place will adjust the torsion bars for you or you can do it yourself. It takes 5 minutes and a wrench. Most tire shops wouldn't charge you if you bought the tires from them.